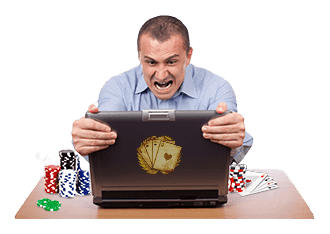 This is a discussion on Top 5 Ways to Beat Tilt in Poker within the online poker forums, in the General Poker section; Every single poker player has been the victim of their own tilt. Anyone who says otherwise is either in denial or lying to your face. Every single poker player has been the victim of their own tilt. Anyone who says otherwise is either in denial or lying to your face. Believe it or not, you can learn to conquer and overcome tilt, and not let it get the better of you. Controlling tilt is an essential skill for any poker player to have if they want to be successful at the game. Here we have the Top 5 Ways To Battle Tilt At the Table. Click to read the article, then tell us here: what was your biggest take-away from it? How do you battle tilt, or do you have more advice for the poker newbies out there? to beat the tilt you need to work on your mental game. I would start ofc from understanding what variance really is, but imo we should work much on our brain like meditation and health life. If you don't feel good it's really hard to avoid tilt because you are naturally more nervous and you stress more. In my opinion tilt will be beatten only after you have many poker games played so it will be beatten by experience. Once you played many poker games you become use with losing good pots with good cards sometimes so in time the anger after won't appear anymore after a while. Are you tilting right now? well, the experience in poker also teaches you to quickly overcome the descends of animosity in bad plays, the beauty of poker that you will always have your revenge, you just have to look for it, success is persistence, luck always favors the persistent. When I started poker, I played hours on end in cash gamer holden zoom, not at first, my mind was fresh and I always won, that is, I left the tables with the double of my starting chips. But with the passage of time in an interval from one day to another the game was changing, and since I was playing at that level a lot, I could not see the changes, and with the passing of time I was losing and I could not win the moves anymore who won, sometimes lost by variance and hit nothing on the flop, sometimes lost by pure mistake, but as I was starting I could not realize that I was tired and was going through tilt. Today, to not suffer more from tilt, I seek besides playing poker, other activities like reading something, watching TV and still rest every 2 hours played in cash games. When I take some bad beats, I try to put myself in the situation and see that moment could have been mine and it would be selfish not to accept defeat because in poker everyone is subject to gains and losses. Good points. The most important for me is to understand that bad beats, coolers and suckouts ar part of this game. You cannot avoid these things. The second most important point, is to always have the mental strength to close the session and take a break. There's a documentary called "All About Uncertainty" about Quantum Mechanics that talks about uncertainty. Physicist Leon Max Lederman says it can be comforting for many people to have certainty. However, certainty is torpidity and we need uncertainty, because it is the only way to proceed. Tilting is a common thing in the life of anyone. Success is achieved not by those who never experience an inclination, but those who know how to minimize its negative consequences. Tilting should not cause you harm (if we are talking about poker - should not harm your bankroll). My way of dealing with the slope is to clearly understand when you are tilting. This is actually not difficult. And realizing that you are in a state not suitable for a successful game - you just need to stop the game. And that's all. It keeps a hell of a lot of money and nerves. Fortunately I have identified these flaws bound by Article 5 liked the ways to prevent the tilt drop your bankroll. I'm not ashamed to say that this has made me reduce my bankroll numerous times I sincerely hope I have learned to deal better with the tilt. 1. I have a 'notepad' that I usually discount all my frustration after being tilted, you know? I usually talk a lot **** in that notepad until all my frustration is gone. 2. After doing procedure '1', I read again what I wrote while was stressed and often laugh a lot. 3. I often see some of my previous hands in which >I< applied bad beats to other players and see that this happens to everyone. 4. Read some saved articles that I have here from brazilian professional players in which they also complains about bad beats. 5. I watch videos on youtube that I like and I find it funny. Very interesting articles. I read also the the other one, that was mentioned in first one. I think, an important thing, is to determine what brings you on tilt at all and then you can take the necessary steps to avoid the tilt. For example, if the trash talk of others brings you on tilt online, just close the chat window. If you have a a kind of down streak, but you still have the willing to play. Maybe it is good to lower your levels of buy-in. Playing with scared money can bring you easily to tilt. Therefore a proper bankroll management is necessary. With bad beats, I would just start to tag the villain and make some note on him. I wouldn't start yell on him. If you are completely frustrated about several losses in a row, just take a break, at least for 1-2 hours or better till the next day. If it stays like this, play less and on lower limits. Use your more poker free time for learning something new about poker. Btw. number one is great, maybe I should try this at my work. I am often sitting in front of pc there and I am yelling. Don’t play when you’re sleepy. It's funny that this one was chosen for discussion : I know there have been threads here that have been dedicated to " patience , control etc"
Sometimes when you know you have a good hand and shove , then get a bad beat on the river , well now I have lost patience with the software and simply go out the next hand . It's like my give a damn is busted. Thus knowing all this and working on trying to make it in the game - sometimes you can still lose it. It happens and so with online games - there is always the "Next" time. You can't get it let get to you , just try and learn from each time when it happens. Very apt articles about tilt and the advices too.I have passed the bads and the goods situations of tilt. I believe that another way to fight tilt is to read philosophy. It makes you think apter and more accurately. You can laugh, but sometimes it think that every poker site has its own program that tracks the history of every player. When the amount of won money exceeds a certain limit the cards are programmed in such way that the player does not win in any case. I often notice unusual work of the site before the downswing. And the same unusual work of the site before starting the little upswing. NEITHER MEDITATION , NOR POKER EXPERIENCE OR CHANGE OF SCENERY WILL HELP YOU TO BIT THE TILT. You will always feel the fear of losing much more money before the game. Every player would prefer a gradual increase of bankroll instead of being a member of serious downswings and insignificant upswings (which sometimes don't caver the losses). 1. Poker mustn't be the main source of income. 2. If you are in downswing don't play several days or go down on low limits (maybe play freerolls if you can't live without poker even a day). 3. To run point 2 you should limit the amount of lost money during the downswing. 4. Once or twice a week you must read books and watch videos related to poker. The most important for me is to knowing that bad beats, coolers ar part always part of these games, Having your mind trained to see this and not lose ur head will get you past this. Tilt is the biggest problem for me. I'm very worried about the bad bits. All people are different ... for that reason there will be many ways to beat the tilt ... the important thing is to find the way that suits each one ... in my personal case ... I take a break that can last between a couple of hours until a day ..! It is proven that if we play with our emotions and lose control ... well we also end up losing our money ..! My biggest tilt was when I lost 2500EUR that I had won in a freeroll tournament in just one day playing out of bankroll. If I had to give advice to newbies, it would be that they are studious players and respect their bankroll, not like me that the only thing they do is lose everything. Tilt might be the biggest reason you lose in poker. Yeah,it is really hard to stay emotionless while losing with A A to 3 9o but playing 100% focused is the way to beat tilt and win. The article about how to deal with a huge tilt might help me avoid the reasonless calls and raises in poker while being tilted The article might help you deal with it,a couple good advices is the right way to stay away from tilted poker sessions and losing a lot of money ! My advice to tilted players is to stay calm(this might also help you avoid the tilt)! Having some humility and recognizing you can't always win is one way of combating tilt. The truth is that it is frustrating when we do our best game and an opponent beats us with bad cards but incredibly matches community cards; like other situations that have happened to me, that playing online poker when I'm about to win a big table I drop the internet or software fails; we may fall into a tilt state at that moment the detail is to get out of this fast and take the advice as: Do not get emotional, wait for Downswings, understand when you are inclined, keep doing the right things and take a break. Only play premium hands like AA and KK then boom. Take a break for 10 minutes read cardschat posts make cup of tea laugh. do not deviate from the plan. Another great article and this time of utmost importance for a poker player, very complete and also with excellent tips to combat the tilt. Every time I have to do the weekly tasks what I enjoy most is reading these interesting articles and also very educational. I will take into account this hahahaha yua that I usually go into tilt many times when I run into players who make me a barbased that take me out of it and then the bad beats. Unbelievable! Is this article new or old? I swear to God, I thought I had tilt under control but today I almost wiped of my bankroll from entitlement tilt. Playing the 0.25 spin n go and somehow I got the 6x multiplier a lot of times and I managed to lose every time either by bad play or bad beat. I was so tilted with the thought that I SHOULD win them or that a higher power own me a favor for the previous bad beats to make up for at least one. I was so tilted I played a couple of higher shark-infested spin n goes, played some tourneys beyond my bankroll proper buyins and played ultra aggressive cash games. I end up losing even more. I was so tilted, I took a towel, made it like a ball and started throwing punches until my hand hurt. That didnt calm me down a little. The even worst thing was the rage and entitlement tilt started to get hold of my daily life out of poker. I was angry that this or that wasnt where it SHOULD be or expected by some higher power or something. Nothing could calm me. I went to google. Typed get over poker tilt and results lead me to this article. Which made me realise the fallacy of entitlement tilt and instantly calmed me. Because of all the anger, I was unresponsive to the daily routines I should do, I felt sick in my stomach and I wanted to just sit at the bed doing nothing. The part of playing abc contrary to letting tilt make you take emotional decisions made me continue my day as usual and snap out of tilt. So, thanks Cardschat for helping me not going broke and keep my sane!! With time and experience I learn to control a little bit the tilt.I still have sometimes a mini tilt moments but it's far from what it was a couple of years ago. When I see that I start to take the game and bad beat personally and not as a part of variance I usually take a break from poker.It can be a day or week even a month or two all depend how big the down swing was. There is no magic formula we are all human and it's not easy to completely shut down our emotion in poker. For me playing and losing has helped keep an even mindset when losing and winning not getting to high or low for each. Getting emotional about tilt is a serious problem. Of this problem I suffer straight because I often enter the table just to see a flop, no matter what happens. In Ps I'm in Downswings great, that's what makes my game tense, because whenever I'm there, I remember I need to get out of Downswings, it's been messing me up. Tilting can come from other places rather then just the table I find. As much as I love playing, family matters tend to come into play and is priority if a your a family man. Trying to play competitively in a busy life style environment can definitely lead to making mistakes and playing a poor game, which can all lead to tilting. And when tilt hapeens, bankrolls suffer. This scenario is probably felt more by tournament players. Thanks for the articles and tips are very good, the tilt is something I have to control, often you can affect another tournament you are playing, and the tilt can end up losing a tournament in which you came good. A lot of people and articles advice to take a break from a poker. But what you solved by that? You just forget what happened, so it can happen again in the future, you just delay your anger to next game.!!!! I think you should analyze your play(right after playing,) or (still on tilt) with somebody who play really well and he can tell you straight away what could be wrong about your play, so you will find a lot of times, you could play better this hand. than you can analyze and find out the answers, so you can prevent your bad game OR your bad emotions to happen again. Video of Negreanu helped me with tilt.Here is a link. Good article. Being well fed and well rested can help avoid going over the edge on tilt. Nice article but seems like I don't need it!I have experienced so many bad beats online like many other players which make me think like what happened is the standard outcome ha ha plus I am an easing going guy both in real life and whenever I play. Having someone calling other fish etc makes more ''angry'' than a cooler. Stop playing after a bad beat is the most helpful of all,especially in cash games, many players after a bad beat try to gather again their lost money and that makes them extremely vulnerable at the tables!! The slope occurs with any player.I, to reduce the loss, I advise you to use the responsible gaming button.I always put a limit on the buy-in. My problem is taking a losing session in stride. If I'm ahead in a game and don't get off the table at my peak I'll stick around until I go bust trying to get all my money back and more. I need to learn to walk away a little disappointed rather than disgusted. get out of the house!! drive fast telling yourself how much of a dumbazz you are, then after the self verbal abuse, park the car and gently sooth talk , calm down. Poker is very similar to a real life. And of course sometimes you loose your game and start getting emotional about tilts. But the thing is that you should stay calm and be patient to overcome it. You should have confidence but at the same time be ready to loose and try to accept it. It's a great psychological training that helps in Poker and in Life. You must understand that the situation is changeable and you will win next time. But you must keep going. I still tilt during tournament. When all running good and then come a bad beats. Now begin dunk play, in this tournament and all others. When out of all games, I have to stop poker till the next day.